The Swirl is a revolutionary new chassis from Tendercare. Accommodating a wide variety of seating systems, including our own Snappi (as shown in the photo), Modular and Snug Snappi seats, the Swirl is one of the most versatile chassis around. As the Swirl can be fitted with both our own and other's modular/moulded seating, you can retain both the ease of use and elegance of a buggy whilst incorparating the special requirements of modular seating. Historically modular seating has been associated with awkward and bulky wheelbases; however, with the Swirl chassis, this is no longer the case. The Swirl's rotating mechanism caters to both your own and your child’s ever-changing needs. The Swirl can be easily rotated to either a forward (world-facing) or rearward (parent-facing) position so if, for example, you need to see your child for safety reasons but also need to transport them in a wheelchair-accessible vehicle, its innovative swivel design allows the seat to be rotated forward with your child still in their buggy. This allows for a smooth, stress-free transition for both parent and child, making the Swirl the perfect choice for your special needs pushchair. The Swirl has a unique tilt in space facility which offers a high level of tilt in space between 0 and 41 degrees. There are no fixed positions; rather, the occupant can be positioned at any angle within this 40 degrees range. 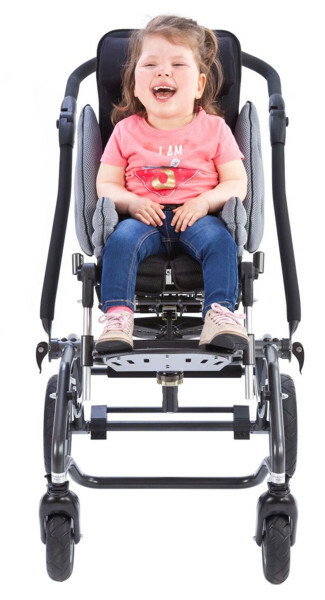 Furthermore, the Swirl’s full range of tilt is available both when the child is forward-facing and when they are in rearward. This means no compromise need be made between your child’s postural needs and your need to see them. Should your child need back recline, the Swirl is compatible with the Snappi seating system which provides a range of reline of 90 – 140 degrees. Additional postural and everyday accessories are available for the Swirl to ensure each child’s individual needs are all catered for. Our full range of accessories can be viewed by clicking here.